I was craving quinoa. I was craving healthy. Thank heavens for Pinterest. I searched my Pinterest for quinoa salad. A gajillion recipes popped up. Zesty Mexican. Kale Quinoa. Brussel Sprout & Cranberry Quinoa. 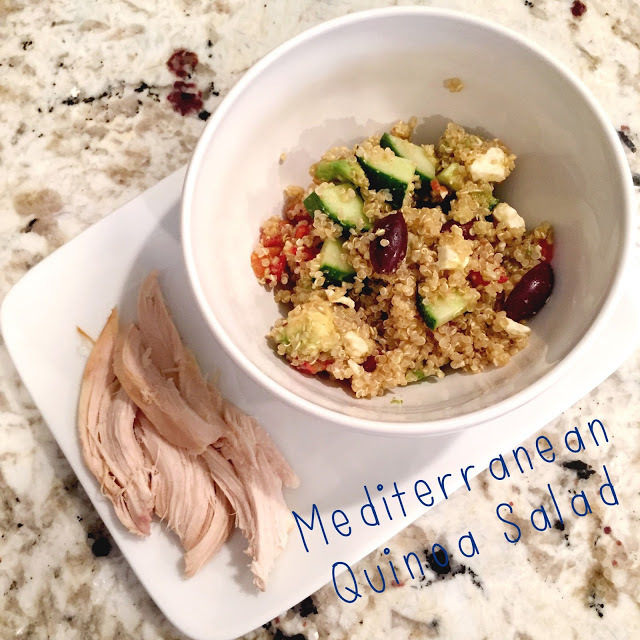 Greek, Mediterranean, Southwestern… You name it, there is a quinoa salad recipe for it. I was drawn to three. As a result I purchased ingredients for the southwestern, mediterranean & kale versions. I settled on the Mediterranean Quinoa salad as the cucumbers I purchased would most likely go bad before any other ingredients and I’ve been eating a lot of Mexican food lately with more to come in the very near future. The results; so delicious, so simple and easy to make, so satisfying. I got the recipe at ifoodreal.com and loosely followed the recipe. I added ingredients I prefer, I removed those I’m not a fan of, I enjoyed this dish fully. Dig in. Enjoy. Feel guiltless for creating such a satisfying and healthy meal. I added chicken for extra protein, but quinoa is clearly an ingredient worth playing with and creating with. What are some of your favorite healthy recipes?